"Hey, what's with all the green?" Well, there are some other colors in there too, but yes, this was taken fairly early in the autumn in a year where the color developed rather late. As a huge fan of fall foliage, I am often extremely impatient -- I can't wait for the color to come and have been known to "jump the gun", as it were. 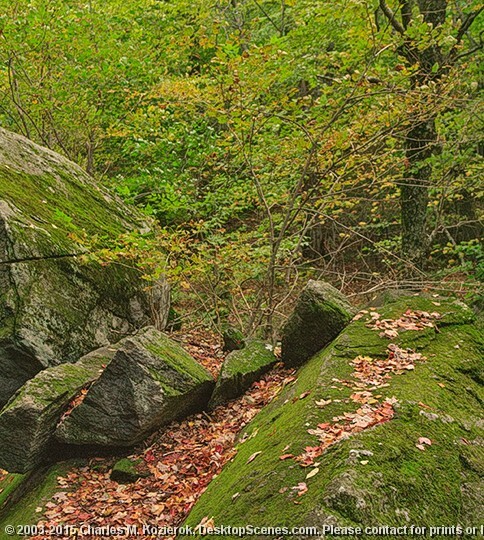 Still, I enjoyed the interplay here of the granite boulders, the moss, the greenish-yellow just-turning leaves and the first leaves already on the ground. This image was taken at Molly Stark State Park, a beautiful place just west of Wilmington, Vermont. A short trail leads to an old fire tower that provides expansive views of the southern Green Mountains.